A Fund has been set-up to install a permanent memorial in the town to one of Britain’s greatest musicians and arguably Redditch’s most famous resident. The John Bonham Memorial Fund will aim to collect as much money as possible to have a statue or sculpture erected in honour of the Led Zeppelin drummer who was born, educated and grew up in Redditch. It is hoped space will be found within the town centre for the statue, with the bandstand area previously mooted. The fund has been set-up by Sam and Clem Dallaway, who run Rocktave Music Teaching Studios, Ros Sidaway of Vintage Trax and Alistair Hayward-Wright of chartered accountants Hayward Wright Ltd. The group say not only would a permanent tribute to the town’s most famous son be a fitting memorial but it would also provide a boost to the economy and provide a visitor attraction for Led Zeppelin and music fans worldwide. The fund will be officially launched in the Autumn when an online donation page will also go live to allow fans across the globe to contribute. The project is being supported by Redditch Town Centre Partnership and Redditch Borough Council’s arts and leisure service as well as the Bonham family. John’s sister Deborah told the Standard seeing a statue erected in her brother’s honour would mean a lot to his surviving family. “I’m absolutely thrilled about it. John was unassuming so he’d probably be a bit shy about it but I know he’d be very proud,” she said. “I wish it had happened when my dad, mum and other brother Michael were alive, it’s a shame they are all gone now. To help kick-start funding for the project, Southbank Publishing has reprinted John Bonham: The powerhouse behind Led Zeppelin which was penned by his late brother Mick. Copies are available from Café Mambo on Church Green East. The first dedicated fund-raising event is also being held next Friday (August 9) at Redditch United FC’s Valley Stadium. Owners Chris and Sallie Swan have donated use of the room for the night which will include music from Kaleidiscope Rock Roadshow/DJ Andy Pyatt, and live music from local classic rock band, After Damage. It starts at 7.30pm and costs £5 per person. David O. Russell‘s new film ‘American Hustle‘ takes place in the late ’70s and early ’80s, which means two things: Lots of bad hair and plenty of classic rock on the soundtrack. You get plenty of both in the movie’s first trailer, which debuted earlier this week, treating viewers to some spectacular ‘dos (including a fro for Bradley Cooper and a combover for Christian Bale) while working in Led Zeppelin‘s ‘Good Times Bad Times’ — a solid choice for the soundtrack, given the movie’s subject matter. Co-written by Russell and Eric Warren Singer, the ‘American Hustle’ script takes its inspiration from the real-life FBI case nicknamed Abscam, which started as an investigation of stolen property trafficking before evolving into a stunning uncovering of high-level bribery and corruption in the U.S. government. Ultimately, convictions were obtained against a senator, six members of the House of Representatives, an INS inspector, and elected officials in New Jersey and Philadelphia. The film, Russell’s follow-up to last year’s Oscar-winning ‘Silver Linings Playbook,’ is scheduled for wide release on Dec. 25. 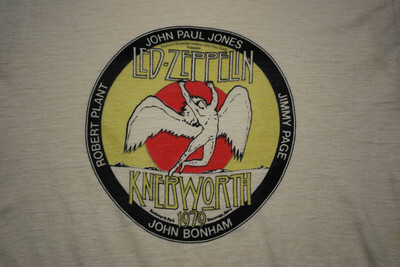 On the 34th anniversary of Led Zeppelin at Knebworth…. 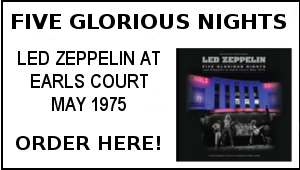 I was just 17 and lived in the far flung reaches of Suffolk but I knew as a massive Zep fan that I had to go, as this was billed as their last ever concert. In the end there were eight or nine of us (ages ranging from 16-22) who got tickets and who got on the train for Stevenage. I suppose we must have gone on the Friday ready for the Saturday concert but in truth I cannot now remember. Getting off the train was just a stream of people heading up to the site but I do remember stopping at a small supermarket for food and drink supplies. We put our tents up in a circle near the edge of the camp site so rather than risk the toilets we popped into the wood next to us. Without the now requisite large screens Robert Plant and the boys were pin pricks in the distance but the atmosphere, music and the fact you were at what you thought was the last Led Zeppelin concert just made for a great evening. 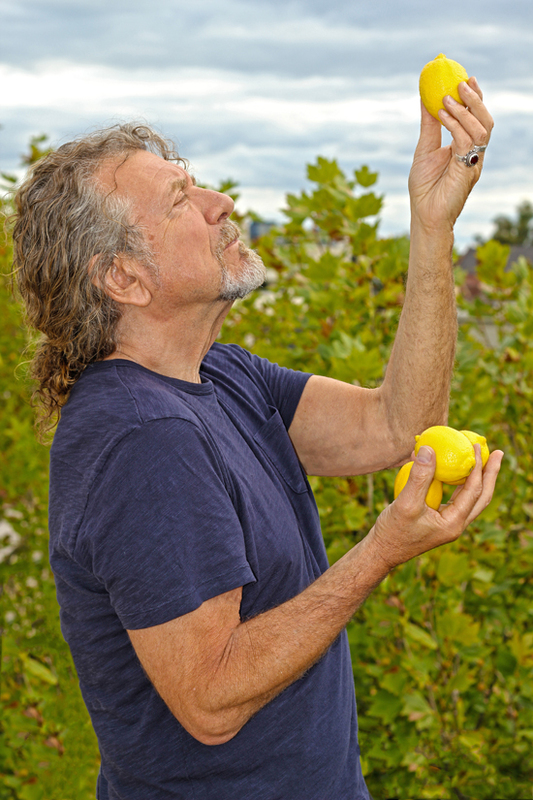 I look now at the cover of the programme and wonder why they were dressed in such straight gear – Robert Plant to me will always be skin tight jeans with a tell tale bulge and a floaty shirt undone to reveal his chest. I’m sure I speak for many. Did you spot us? If you were at the second concert you probably did. We were the couple everyone was trying to avoid on the journey home. Put it down to my partner Sparky’s brilliant idea of a short cut… The concert had finished and everyone was piling out of the fenced off arena. Spirits were high, and we were in a hurry to find our tent and crash. It was pitch black and the cigarette ends lit up the queue going to the camp site which stretched ahead curving in a right angle after 100 yards or so round to the left. Why wait in line? Sparky decided we’d cut across the right angle and join the queue further down. I dithered as usual thinking through the fog of booze and joints there must be a reason for the dog-leg in the queue. He grabbed my hand and started to run. We got up quite a speed until the earth gave way beneath our feet. Naturally I started to cry. Two friends who had followed us but stopped short when they saw us drop into the pits tried to pull us out. We eventually popped out of the poo like corks out of a bottle. Louise Clarke – Ipswich UK. Led Zeppelin, that’s Whole Lotta Love, Rock And Roll and Stairway To Heaven, right? Yeah, and Space Station Number Five? No, that’s not Led Zeppelin, he doesn’t sing that one…oh right. So at fourteen and a half (the half was very important at that age!) years old, we were going to Knebworth. I already had a copy of Led Zeppelin 4, or was it Four Symbols, or Volume 4?. Didn’t matter really, but it never had Space Station Number Five on it, I knew that. We were all Status Quo in those days, and my paper round money had just gotten me a copy of ELO’s latest album, Discovery. Saturday August 11th: We were being picked up some time around six in the morning I think; anyway, you’ve probably gathered by now, that we didn’t have any tickets, not one between us, and WE were now about six or seven of us ( I swear, if I ever bump into anyone from the band, I’ll give them the £7.50). How were we going to get in? No idea, but there was a plan hatched. Dave had a dark blue transit van and Tim’s dad was a bus driver. Bus drivers wore uniforms, so Dave donned a white shirt, borrowed the driver’s hat, and hey presto! We were now a security van with a guard – they’re bound to let us in now. It’s about an hour’s drive down the A1 from Kettering to Knebworth. On arriving, everyone piled into the back of the van (to hide), Dave put his bus drivers hat on, and the van was ushered along towards the arena. No problems at all, but was there ever going to be? Who knows? But we looked like a security van, complete with a security guard in a uniform. The van pulled up, and reversed so that it sat with its back against the arena fencing. If you look at a picture of the site, looking from the stage we were at the back and to the right. Out we got, and one by one climbed on top of the van, and jumped into the arena. We were in. Where was the site security? I felt for sure that we would be kicked out, but there was no one about, it was pretty empty at the top end. Having read Freddie Bannister’s account in his book, ‘There Must Be a Better Way’, I know why that was the case. We made our way to a hot dog van, which was about halfway down, on the left, if you look at the stage. The guy in the van was selling his hot dogs for a pound! Now in 1979 a pound was a lot of money, it was what I got in pocket money for a week. All the guy said, when words like, ‘a Pound, are you joking? – I only want one mate’ were put to him was, ‘I have to make a living’. I wonder how much he was charged for his pitch, but mind you, he could’ve sold about 40,000 hot dogs that day, who knows? Anyway, about 8pm, there’s a band on stage – it’s half the Stones. I don’t really remember too much about their set, but I did know Jumping Jack Flash at the end. We’ve noticed that the gates were open at the top of the arena, great. Dave fetches the van and brings it in to the arena – well, he is a security guard, and that’s a security van after all! We now have a vantage point, we all sit on top of the van, and we’ve got a good view. There were some strange people around too, blokes just piddling where they were standing. I also saw a couple in a sleeping bag by the fence, clearly not interested in the music, but very active! I remember thinking that it was getting late, it was after 10, and it was cold. A ‘no thanks’ was given to a guy, after offering us something to smoke. At last, Led Zeppelin arrive on stage. Wow, look at that, a massive screen, I’d never seen anything like it before. The sound was loud, and the sound/visuals were slightly out of synch, obviously, due to where we were. Some of us weren’t sure which one of them was Led Zeppelin, and they didn’t play Space Station Number Five either. We left before the end. I think it was about 3am when I got home, and my Dad was up, standing outside the house waiting, there were no mobile phones in those days, that you could ring home with. 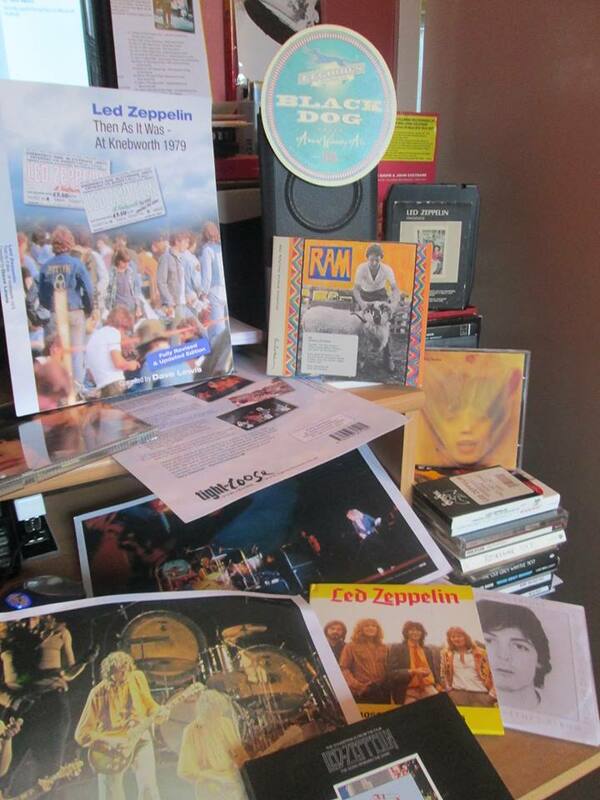 My Led Zeppelin journey really did begin that day, it wasn’t too long after that, that I had all the albums, T shirts, and an Earl’s Court programme. Many years later I got hold of a bootleg VHS copy of that night, rubbish copy really, but it was that night after all; in fact, I still have that tape in the cupboard. I got a downloaded copy some years ago that was much better, the sound was good on that, and looks good on my iPod too. 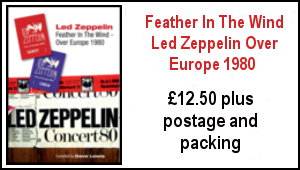 When the official Led Zeppelin DVD was released in 2003, that was the first part that I wanted to see, and I wasn’t disappointed. I would like to see the whole show released at some point. Another busy week here with more work on the Knebworth book ongoing and TBL 36 ahead. The Rolling Stones feature is a nigh on wrap and I’m now about to commence a Paul McCartney feature so August is well packed. 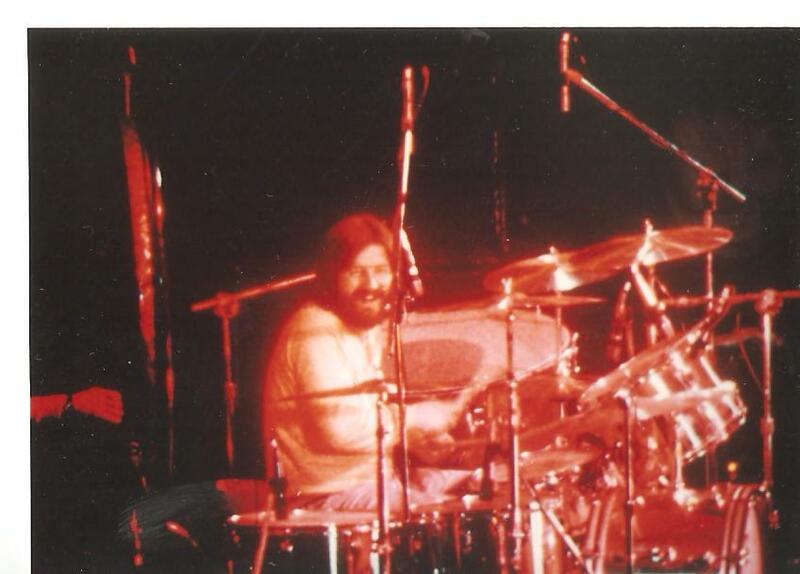 Plenty of news bits this last week…the John Bonham Redditch statue idea is an excellent one and it would be great to see that come to fruition…Robert’s twitter presence is also most welcome and his official website in its new revamped format looks superb. On the player, unsurprisingly some Led Zeppelin at Knebworth (34 years gone), Paul and Linda McCartney’s Ram album as I get into the Macca zone for the feature I am about to undertake, Robert Plant SSS Chicago, Fairport Convention Live at the BBC (great BBC 4 doc last week) Peter Frampton I’m In You LP and Miles Davis Round About Midnight. 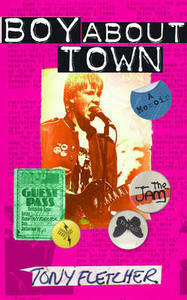 This past couple of weeks I’ve been reading Boy About Town, the early memoirs of Tony Fletcher. Tony established the Jamming fanzine in the late 70s when he was still at school and went on to wrote major biographies about REM, The Smiths and most notably the brilliant Keith Moon Dear Boy. It’s a captivating rites of passage yarn which I can well relate to. It was interesting to read that Tony was in attendance at the Who’s Who exhibition launch at London’s ICA in August 1978 –in the book he tells the story of how he met and spoke to Keith Moon on that day. Coincidentally I was there that day too with my good friend Dec – and I also got to speak to Keith Moon as can be seen below. The Who film The Kids Are Alright was being put together then and the director Jeff Stein told me the footage of me leaping onstage at the Shepperton gig in May was likely to be included. 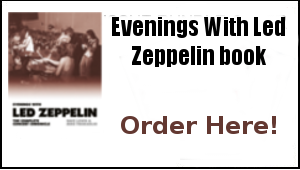 Hey I had to do something when Zep was off the road! 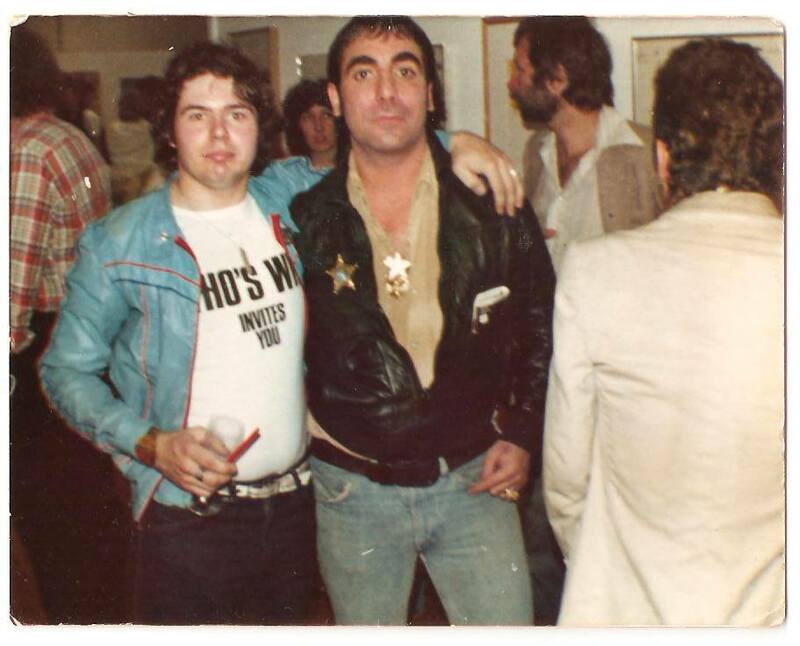 Above: The young DL with Keith Moon – ICA London, August 1st 1978. And yes you’ve probably seen it before but (once again!) here’s my leap of faith with The Who can be seen here – I make my presence felt at around 9 min -30 -cuffing Roger Daltrey in the eye in the process…sorry Rog! It’s a big day tomorrow ( Friday) here as the boy Adam turns 18. 18 years ago back in 1995….and as usual the story is intrinsically linked with Zep related happenings. When we found out the good lady Janet was pregnant early in 1995, I’d just signed up for a package tour with Gary Foy to take us to two Jimmy Page & Robert Plant shows in Meadowlands Arena in New Jersey in the early April. As the pregnancy progressed, so did the Page & Plant happenings. After the US trip (which was amazing), I was in Paris on June 6th for an equally amazing show, and then came the UK tour –Glasgow On July 12th, Sheffield July 13th and then to St Austell and Poole. Later in the month the good lady Janet carrying child, did venture with us to Birmingham NEC for the July 22nd gig. Finally it was to Wembley for the July 25th and 26th dates that closed the tour. Our impending arrival was due late August but as Sam had been 6 weeks early, all during those gigs I was on tenterhooks continually aware there could be an announcement over the PA that a Mr D. Lewis should leave the building and head home rather swiftly! As things turned out, I had two weeks to spare…on the afternoon of Tuesday August 8th 1995, I had a call from Janet at the Our Price store that I managed in town that things might be on the move. Janet did go in hospital in the late afternoon but came home as all appeared calm. 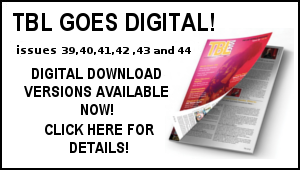 I therefore thought it was quite reasonable to take a phone call in the early evening from then TBL webmaster Dave Linwood to discuss TBL matters such as the latest P and P Tarantura CD releases. Not so as Janet was upstairs in the early stages of labour! Here we are 18 years on and Adam is celebrating his 18th birthday…having got through many years of hearing the strains of the Zep echoing from the TBL work station and inheriting his Dad’s affinity for Tottenham Hotspur FC and all the ups and downs that goes with that …and turning out to be a far better footballer than his Dad ever was for sure…. 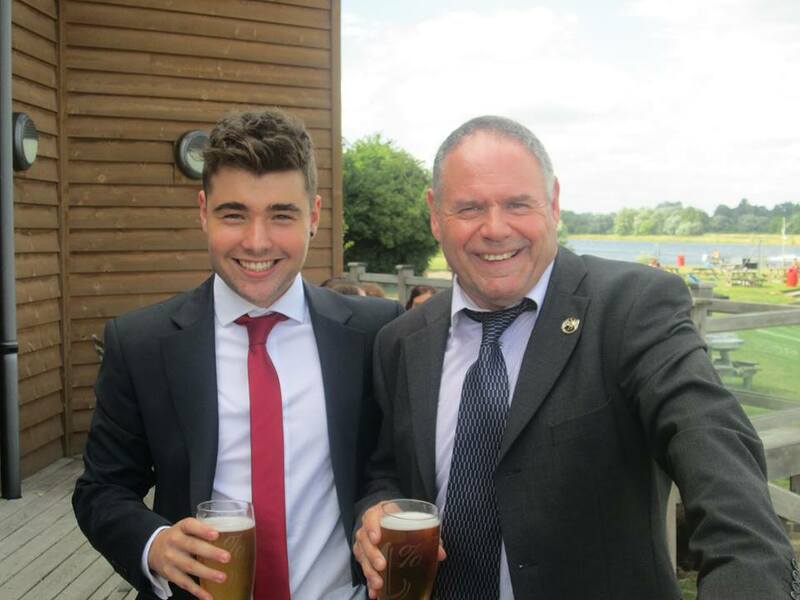 It will be something of an event tomorrow to buy him his first official alcoholic drink (although he does have a little taste for it, as can be seen in the pic below from last weeks wedding). 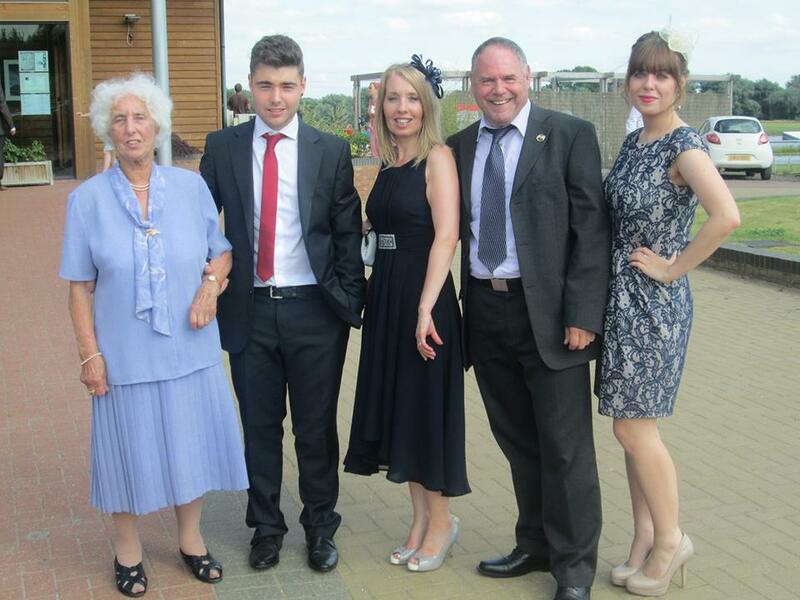 Happy 18th Birthday Adam – have a great day! Dave Lewis/Gary Foy – August 8th , 2013. Thanks Gary D and Ed for lovely comments! Very nice father/son photo with the adult beverages. Always a fond rite of passage for anyone whose kids are coming of age, as many of us now know and have experienced. I raised a glass with my daughter for the first time this past May, and feigned surprise when she knew exactly what to order from the bar maid!! Nice family photo, Dave, and good to see Betty doing well. I hope you didn’t get her too tipsy! Those TBL fans with a discerning eye will notice the legendary Lewis hand-on-hip stance adopted by Sam for the photo, ironically not used in that particular snap by its mighty creator! Good spot Rudi re the Who Are You cover – there’s Roger and Pete trying to look contemporary and then The Ox has the biggest flares going! The Zep Knebworth shoot did show them in a more modern style…as for the outtakes the story of that is revealed in the book! Hi. Interesting point from Louise about the band’s “straight gear” at the Knebworth photo shoot. This was post-punk and fashions had altered somewhat from 1973. If anything, I always thought it was a very natural photo of the band at that time. I never thought anyone had told them either what or what not to wear ? As we’re on an apparent Who/Zeppelin timeline synch, The Who seemed to be going through a similar phase 1978/1979 regarding offstage/onstage clothing – see the back cover of “Who Are You” for comparison. Zep airbrushed out the evidence of John’s healthy diet and The Who decided to disguise Keith’s with a chair. I guess the point is….Page never went wandering around Kensington wearing The Dragon suit…and I don’t think Plant was ever spotted in Kidderminster wearing one of his blouses or kimonos. I wonder if Louise has ever seen the outtakes from the Knebworth (or should that be Knobworth ?) photo shoot. Will you be putting the full set of those in the new Book Dave ? :o) Rudi.